A compensation agreement is used to supplement an already existing employment agreement between an employer and employee. The compensation agreement is used to describe a revised employee payment scheme and when it will be in effect; the remainder of the employment terms are unaffected. 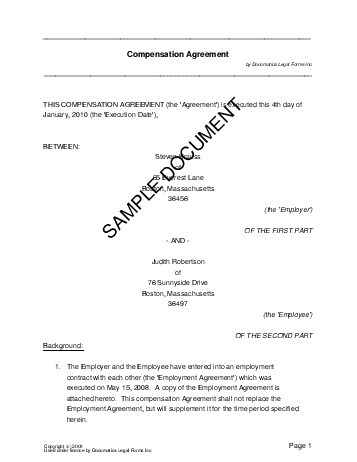 Will a copy of the employment agreement be attached to this document? Is this agreement replacing an existing compensation agreement? Will a copy of the prior agreement be attached to this document? Will the Employee's overtime compensation change? Will the Employee be receiving bonuses? How many bonuses do you wish to describe? Will the Employee's vacation time be changing? Do you wish for the Employee to be able to assign this agreement to another person? By selecting 'yes', the Employee can transfer its rights in this agreement to another person. Do you wish for this agreement to be severable? By selecting 'yes', you are saying that if one part of this agreement is invalid for some reason, you want the rest of the agreement to be enforced. Do you wish to state that time is of the essence? Do you wish to state that the headings in the agreement do not affect its meaning? Do you wish to state that this agreement represents all the terms of the Employee's compensation? By selecting 'yes', you are saying that all changes to the compensation are written in the agreement, and anything not written in the agreement will not be honoured. We strongly recommend obtaining an attorney reviewed Compensation Agreement directly from us.